Let's expand our repertoire of FP lore/knowledge together. Either vintage or modern pens, from time to time you'd hear about (or bought from ebay) a brand so obscure that you wonder if anyone else know about it. Share and tell us what you know (or don't know) about it. Not limited to one, of course, the more the merrier. PS: Bonus point if you actually have the pen and can share a picture of it. If one can think of it, doesn't that make it less obscure? For example, I can think of a few brands that I know not a whole lot of people have heard about. That brand is still obscure, right? But at least I know it and I can tell others in this thread. Now, as the result of this thread, I hope that some brands will became less obscure. The other motivation for this question is that I'm curious as to how widespread everyone's knowledge is (are?) regarding brands, maybe a lot of people here thought brand A is common, yet I never heard of it. Anyways, just something to think about in these hot (as in blazing hot) days. How about the Silver Arrow? Late forties, probably made in a machine shop that had been doing war work and was looking for a new product. Sadly, this was not it. I have seen just three in the last fifteen years. I like pens from behind the Iron Curtain. Would any of those count? Or is this question limited to modern brands? Are we talking boutique or custom pens? Or are we talking standard manufacturing? As I already mentioned in my original post, either vintage or modern brands are welcome. To expand that even further, any pens made anywhere in the world is welcome. Also not limited to mass-produced pens, I would like to know any custom pens (different than kit pens), limited run production pens, etc. After all, the goal of this thread is for us to learn together about something we didn't know before, Deb and Jon already gave me education on two pens I've never heard before. Last edited by penwash; July 24th, 2018 at 06:34 PM. What about this a "Brecon Professional" fountain pen. This is mine at least bought it off fleebay 2 weeks ago it has a section like a Montblanc 622 and has a gold nib. I can only find one other mention of the brand (on FPN) someone wondering what they had bought. That Brecon Professional is a very interesting pen, top pen. I can't find anything useful about it. Jon, that's a magnificent leaf-shaped M&C nib that you show. I've had many of them over the years; some flexible, others firm. some with the tilt to the tip, others without, They are very beautiful and practical nibs. I used to pick those pens up for a song, now they fetch serious money and rightly so. It's a Winstona and it's a Dutch piston filler. That's all I know about it. 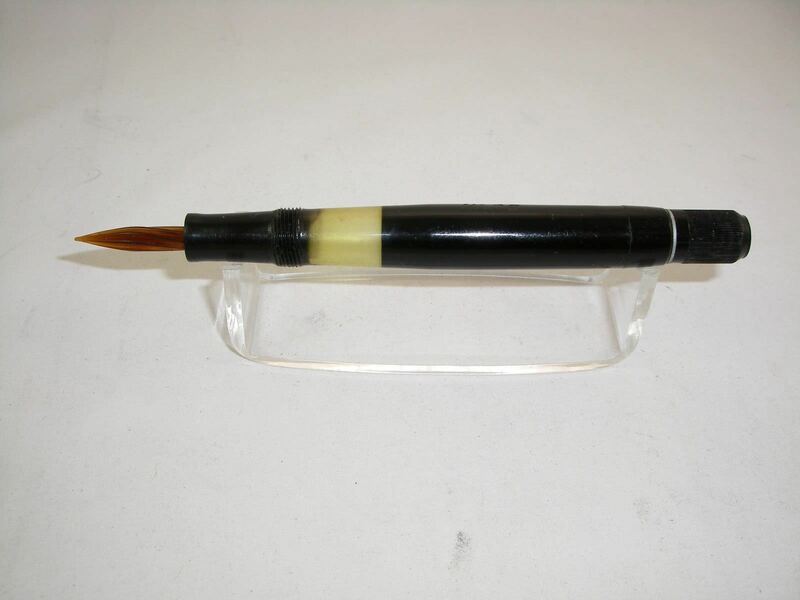 The first pen we ever restored was a Federal, and ugggglyyyyy....yellowish-ivoryish beater, that had at least ten different ink colors stuck in it, and took a size NINETEEN sac. There are also a couple of well-beaten, clipless sac-filling no-namers (I did call the first one Jezebel). Penwash gave me the idea for fashioning a roll-stop on these: 'gemstone' chips. Maybe I can get pics later. Okay...they're bad, but, left to right: Federal, two no name red pens. One's a button-filler. Last edited by Sailor Kenshin; July 26th, 2018 at 08:44 AM. 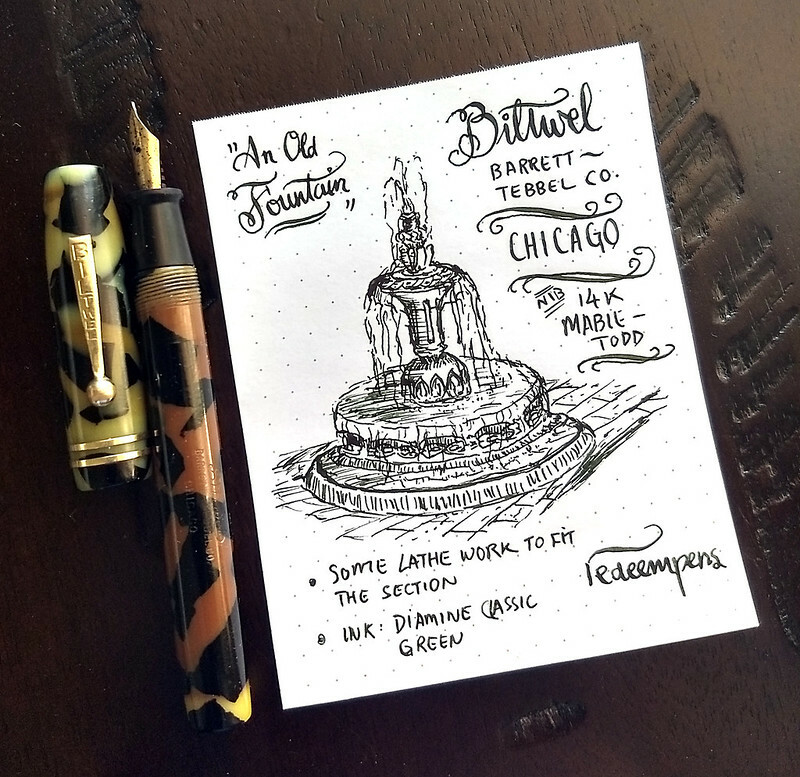 Biltwel is a brand from Chicago. Not a whole lot of info about them, so it's one of those obscure ones. This particular pen shed some light because there is extra inscription on the barrel other than the typical brand name "Biltwel" in beautiful script. Underneath it says Barrett - Tebbel Co. then CHICAGO. 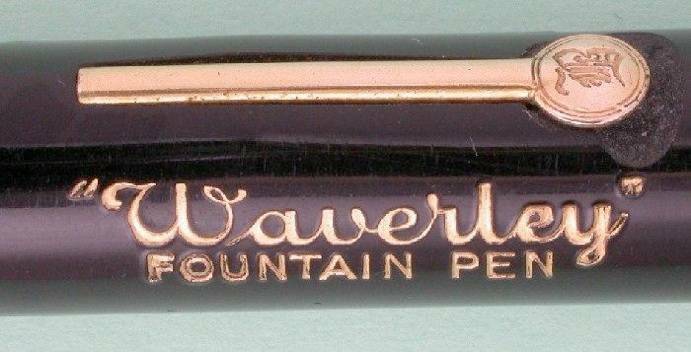 So now we know that this pen was made in Chicago and the name Tebbel may have some connection with the man who gave the world: Parker Duofold. Good detective work. BTW: work on a lathe - did you reduce the section diameter or bore out the barrel a bit? I have or have had, various oddballs here: The Standard Pen, another simply called England, three cheap Empress pens - still here (!) Nothing special - all lever fillers, the lot of them. I have an unbranded BHR pen with lever box filler - clearly good quality, but who made it? Then there are the odd models from well-known makers - I have a Platignum Capillary pen (no cap) for example, and also one of the rather rare Croxley "Silvern Cap" button fillers with two-tone nib. 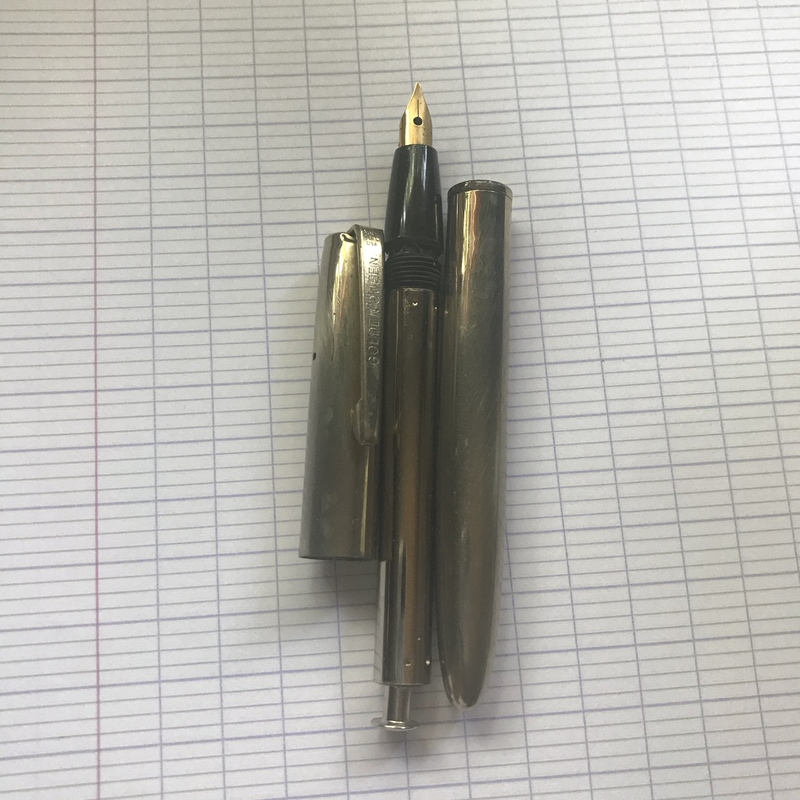 I posted this obscure vintage French "Old Chap" three months ago in the What-is-your-latest-pen-acquisition? thread. I reduced the part of the section that should fit snugly into the barrel. Having done this several times, I really appreciate how careful I had to be. If I were not using a small metal lathe, I won't be able to do this. Last edited by KrazyIvan; July 26th, 2018 at 10:22 AM. Found this little gal a while back. Golden Queen. Don't know much about it other than its a metal bodied pocket pen. Button filler with a gold-plated steel nib. 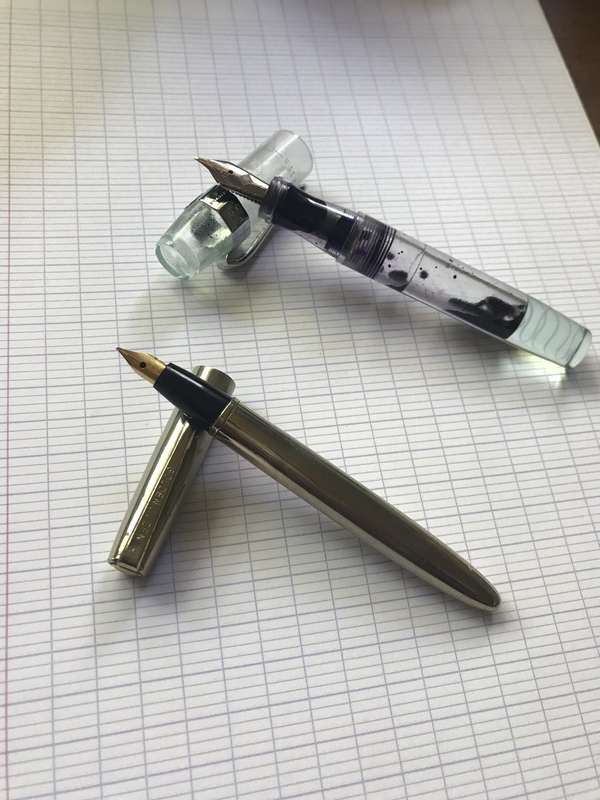 photographed here next to a Franklin-Christoph 45 for size comparison. Does it have a blind cap or do you have to remove the barrel to fill it? I don't see a seam to indicate the former. I had never heard of these before, but I stumbled across this fountain pen on eBay. It's called a Haro, and has a glass nib. They were made in Germany. The button filler mechanism is encased in the metal tubing that is then covered by the metal body. Kind of a shame the nib is plated steel because the pen itself is otherwise very well made.